What killed off the world's largest apes? At 10 feet tall and up to 1,200 pounds, the aptly-named Gigantopithecus blacki were the largest apes the world has ever seen. These beasts went extinct some 100,000 years ago, and surprisingly, they may have been taken down by a diet that was too rich in fruit. No doubt, these animals were huge. Paleontologists aren't entirely sure what they looked like, or how they moved around, but based on the little fossil evidence they have it's likely Gigantopithecus walked around on all fours like gorillas and chimps. Recently, Yingqi Zhang of the Chinese Academy of Science in Beijing analyzed 17 newly discovered Gigantopithecus teeth (which is nothing new; more than 1,300 teeth have been recovered since 1935). 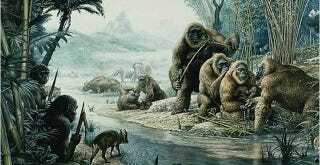 The samples were discovered in China — the former stomping grounds of Gigantopithecus — and date back around 400,000 years ago. Many of the teeth were eroded. This poor dental hygiene hints at a problem with their diet, says Zhang. "There was something wrong before Gigantopithecus's extinction, and I think it comes from the food." The ape may have had to switch diet as the climate cooled and its preferred food – probably plants like bamboo – became rare. The teeth suggest it turned to less-nutritious fruit rich in enamel-eroding acids, says Zhang. Read the entire study at Quaternary International: "New 400–320 ka Gigantopithecus blacki remains from Hejiang Cave, Chongzuo City, Guangxi, South China."